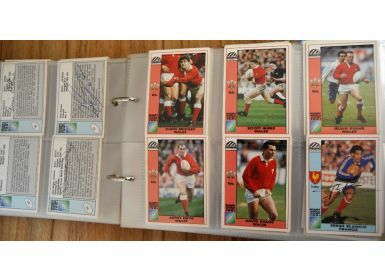 Rugby Trade Card Collection, much autographed: Magnificent packed album of Rugby Trade Cards, all in excellent condition in sleeves and with a large proportion neatly hand signed to front or rear by the stars pictured. 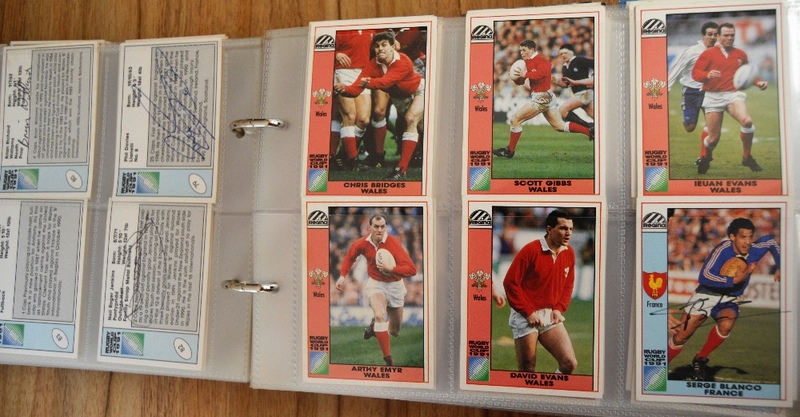 Regina World Cup 1991, original set of 166 inc Checklist lacking only the returnable Competition card; Card Crazy Authentics 1996 NPC Rugby Union Superstars Series 1, Base Set of 90, missing only 23 Jarrod Cunningham and 62 Rhys Ellison; Ineda NZ All Blacks 1997 Signature Series, very attractive, autographs pre-printed in gold Sharpie, full set of 33 inc Checklist; the same set, dubbed instead Scratch & Collect, with no autographs (none scratched, either! ); & Cadbury's (NZ)1998 Memorable Moments, full set of 15. Colourful, comprehensive VG modern NZ selection.